So, what's the big deal about dining inside a home store you ask? Are you listening to yourself - it's just that! The chance to be part of a social dining evening inside a store, and what's more, it came with beer. Yes, chilled beers, some learning and lots of unique food. And then there was the food. The menu was inspired by summer, and of course in true 29. style, it was a creative fusion of homestyle Indian cuisine. I planned a 6-course menu for this evening, with many new dishes & experiments. Thankfully, none backfired! We started with a chilled Gobi (cauliflower) Soup w/ Red Grapes & Dal Moth (Fried Lentil Snack). A refreshing way to start a meal on a sweltering day! I din't get the chance to click a photo, but here is the similar dish from another day so you can get a visual. Course 2 was a salad duo : a first timer on our menu. 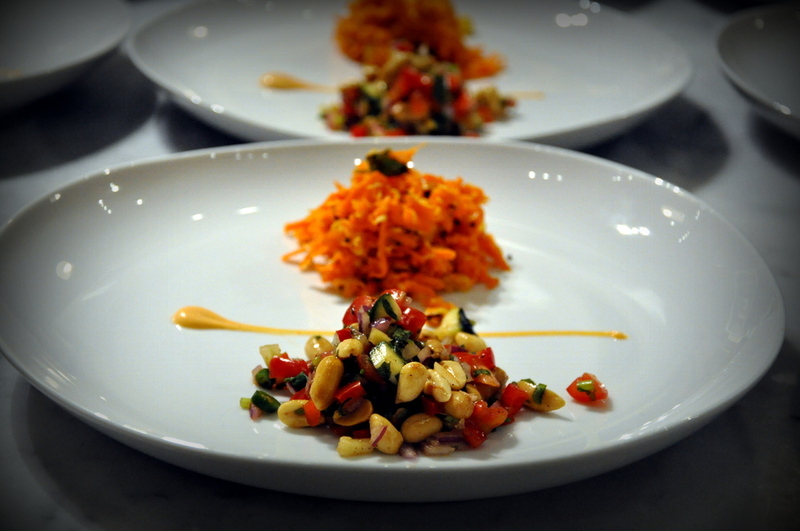 I did a South Indian Roasted Corn & Carrot Kosambari + North Indian Spicy Peanuts Chaat. The divide in the plate was just as clear as the difference between the cuisines from these 2 parts of India! Course 3 was the winner for this meal. It might not look as great as it tasted, but the swoons I heard during (and after) were enough to make me bounce all night long. Homestyle Chana (Chickpeas) Masala w/ Wonton, Spiced Garlic Butter Shrimp & Cilantro Aioli. Oh, and how cute are West Elm's Q-tee boards!? Want.some.now. Course 4 was a dash of green goodness - Spinach Chilla (Chickpea Flour Pancakes) w/ Mushrooms & Arugula Chutney. Now I am not the one to boast, but would you be able to look at this and say it's Indian (inspired) food?! Indian cuisine can be just as sophisticated, well plated & fresh as any others out there - the mantra that drives me everyday. And I hope this plate brings home that very point. Course 5, and the last savoury course was a combination of a spicy & comforting (minced) Chicken Keema w/ Semolina Upma & Cashew Cream. Those yellow flowers - hand picked by me - made this such a treat for sore eyes (and the tummy!). Summer on a plate.